We Want to be Your Waukesha Chiropractor! From the newborn infant, to the soccer kid, to the over-stressed parent, and even to the active senior, EVERYONE can benefit from chiropractic! Gentle and effective, chiropractic treats the source of the problem. Simply put, it offers a solution as opposed to a "cover-up." Chiropractic in Waukesha is a natural healthcare approach that allows the body to heal itself as it was designed to. It is drugless, non-surgical, safe, effective, and appropriate for many health concerns. We accept most insurance plans, personal injury claims, auto accident claims, and worker's compensation cases as well as assisting you with your health savings account, flexible spending plan, etc. Self-pay options are available. New patients are usually seen on the same day with the convenience of x-ray facilities onsite. Grandview Chiropractic Center offers several care levels to fit each patient's needs. Our main concern is to fix the problem rather than just "patching" it up and then waiting for the next blow-up! By providing specific exercises, nutritional support, and home-care recommendations, we believe our approach will give you the best opportunity for overall health. This type of care is simply to get you out of pain as quickly as possible. However, Relief Care is only a TEMPORARY solution. By only addressing your pain, you are still left with the initial problem that will eventually return, and many times, worse than before. For example: applying a bandage to a fresh cut may relieve the bleeding, but it does not fix the cut or control any infections that will likely develop. This type of care goes one step beyond Relief Care by not only achieving pain relief, but - MORE IMPORTANTLY - fixing the areas of spinal weakness. Corrective Care involves a longer duration of treatment as the doctor specifically corrects the underlying cause of your pain. Using the bandage example again: clean the cut thoroughly, stitch the wound if necessary, and then apply the bandage. Wellness Care is also referred to as Maintenance Care. This is the type of care EVERYONE SHOULD CHOOSE! It provides pain relief, fixes the areas of spinal weakness, and ensures periodic checkups to address any problems before they cause pain or loss of function. Choose Wellness Care if you are truly committed to keeping your spine and nervous system both healthy and functional. Standard Process Whole Food Supplements: These supplements are made from several whole food sources and are formulated to contain all the essential vitamins and nutrients we were intended to eat. They are different than typical synthetic vitamins, which are made with chemicals. Quality supplements are key to proper nutrition and health. Please see our Nutritional Counseling Page for more details! Foot Levelers Custom-Made Orthotics: The chiropractor will take a cast of your feet that Foot Levelers will use to create custom shoe inserts. Our feet are the foundation of our bodies, so if their structure is imbalanced, it will affect posture. The result is pain in the feet, back, knees, etc. By balancing your feet, the orthotics will help to reduce the pain as well as support your chiropractic adjustment. ChiroFlow Waterbase Pillows: This customizable pillow allows you to choose the amount of water needed to provide YOUR level of comfort. It delivers stable support for the neck and head, reducing neck pain and headaches, in addition to improving quality of sleep. CryoDerm Pain Relieving Products: Used for temporary relief of muscle and joint pain. It is a liquid gel that causes a cool sensation when applied to your skin. As the gel penetrates to the area of pain, it then creates a warm, soothing response. Chiropractic care is the detection and correction of spinal misalignments (known as subluxations) to restore function and reduce pain. This is accomplished by the chiropractor performing an adjustment to realign the vertebrae in your spine. Also, the chiropractor may adjust an extremity condition, such as a shoulder strain or knee arthritis. Undetected subluxations can lead to chronic pain, illness, and poor health. The labor and delivery process involves significant twisting and pulling to the baby's spine. Examining the spine shortly after birth can fix minor subluxations before they turn into major problems. Children need care because of the active nature of their play, which can cause injury to their bodies. Being subluxation-free helps to keep them healthy and strong. What is the difference between manual and instrument-assisted adjustments? Is one technique better than the other? Manual adjusting is the most common technique the chiropractor may use and it involves using their hands to perform the adjustment. Many times you will hear the typical "cracking" sound, which is the response of air being forced out of the joint. It is the same concept as when you crack your knuckles. Instrument-assisted adjusting, such as Activator, involves the use of a hand-held device to perform the adjustment. Both techniques are equally effective and their usage is determined by the chiropractor's evaluation of each patient's condition. Our chiropractors utilize both techniques. Why am I not feeling better after one adjustment? Many times people associate their pain to one specific event that happened, such as tripping. However, after examination, we often discover other events (that you may not even realize!) also contributed to your current condition. Stress, poor diet, lack of exercise, and even emotional pain, weaken the foundation of your body. So tripping was just the final straw! Simply put, your problem did not occur overnight, so it is not going to be fixed overnight or with only one adjustment. Why do I have to keep coming back for more adjustments when I am feeling better and out of pain? Pain relief is only a small part of the bigger picture. If you stop care once the pain is gone, you have a greater chance of re-injury and/or reoccurring pain. Many times your original problem will return with higher intensity, which may require even more treatment and longer recovery. Once I start chiropractic care, will I have to keep seeing the chiropractor every week for the rest of my life? ABSOLUTELY NOT! That would be like seeing your dentist every week! 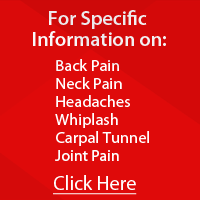 Depending on the severity and your pain level, we will care for you accordingly. This may involve several visits during the first few weeks. After the initial pain-relief treatments, the frequency of your care will be reduced based on your progress. Once your condition has stabilized, the doctor will offer you suggestions for future care, but the choice is yours at this point. Why does it feel like my adjustments just will not hold? Unless you are a top athlete, most people are deconditioned (postural muscles are weak). Because of this weakness, your muscles must be trained to support the adjustment. Our approach to this is to provide you with simple, personalized exercises to be done at home. For example, you support your dental cleaning with your daily brushing and flossing. So by combining these exercises with your treatment, we are confident that your adjustments will hold. There is no rule of thumb for using ice or heat. To be safe and not make your condition worse, please call our clinic and the chiropractor will speak to you directly.